In last week’s blog, I discussed how and why we, at The Groove, value dance and movement to enhance the practice of mindfulness and make the abstract concept more accessible for young children. As dancers and movers, dance movement therapists, and dance instructors we have witnessed first-hand, that movement and dance have the ability to reach children in ways that adult mindfulness practices simply cannot. Not only does dance allow children to develop emotional and body awareness in a way that engages their natural preferences, it can also engage all five senses at once. This week, we are delighted to introduce Erica Hornthal, MA, LCPC, BC-DMT, president and founder of Chicago Dance Therapy in Northfield, IL to share her expert wisdom and knowledge about dance/movement therapy in an interview addressing the question: Why dance? Question (Q): What is dance/movement therapy (DMT)? Answer (A): DMT is a psychotherapy that uses movement as the primary intervention for behavioral and mental health. It operates on the premise that the mind and body are connected, and the body houses all of our experiences—good and bad. Movement, as our primary form of communication, allows for expression that may be too deep for words. DMT is more than dance. It is about utilizing the nonverbal language and communication that our bodies inherently engage in, and learning to listen to our bodies because it always has something to say. Q: So, is DMT similar to therapeutic and adaptive dance? How might it be similar and different, and what are the benefits of each? A: DMT has similar qualities to therapeutic and adaptive dance, but differs in that the primary focus is on behavioral or mental health. All goals pertain to behaviors that impact daily functioning or quality of life. In DMT, the movement is not, typically, instructive and mostly comes from the client. DMT also focuses more on the process rather than the product. It gives an opportunity for your child to express his/her own movement preferences in a safe and supportive environment with a Masters-level dance/movement therapist with training and credentials. 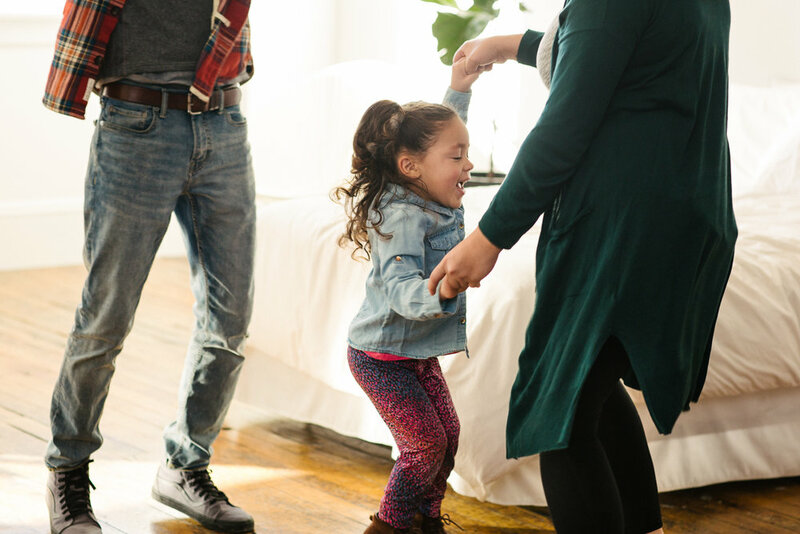 Therapeutic or adaptive dance, on the other hand, is a wonderful option for parents who are looking for dance lessons that can be adapted for a child with differing abilities; and it should still foster safety and support. It may even address behavioral concerns. However, the focus of therapeutic and adaptive dance will be more on the dance instruction, and the goals should be more dance oriented and may even result in a show or performance. Q: Then, what is the value of DMT for parents, their kiddos, and families—specifically those affected by disabilities? What are some of the key take-away concepts in DMT and why are they important for parents and families to consider? A: One of the most important concepts of dance therapy is attunement—think of this as tuning your radio or your musical instrument. It involves intently and intensely observing and listening. This can be equated with paying attention to your child and meeting them in their movements to foster a supportive, loving connection and bond, which is not easy and can be difficult and even frustrating for many parents. Yet, it is important to validate your child not just through verbal language, but through body language, as that accounts for a larger portion of our communication. Another key concept is mirroring. This means accurately and empathetically joining your child in their movements or mannerisms. Q: How might parents introduce and practice these DMT concepts at home with their families? A: A great way to introduce both, attuning and mirroring, is through creative play. Try attuning and mirroring your child during play time. Join in their activity, keeping in mind that we are building an empathetic connection, not mimicking or mocking their behavior. Q: As a parent, what experiences, wisdom, knowledge, and insights would you like to share? A: As a mother, one of the most valuable things I have learned is to pay attention to my child’s body language, not just the words she is speaking. For parents of children who may be nonverbal, this is of utmost importance because this is a way of connecting, communicating, and understanding your child. So often, the words my child utters are contrary to what she is truly feeling. This may be because she is confused, upset, anxious, or truly does not have the language to convey what she is feeling. Practice body talk with your kids. You can ask them to identify a part of the body and ask, “If that part could talk, what would it say?” Or you can ask your child to identify an emotion for that body part. For example, “My tummy is sad because it is hungry.” Observe what your child does and try it on for size (mirroring). If your child is nonverbal, practice paying attention to posture and affect, or facial expressions, in relation to different emotions or times throughout the day. This will help fine-tune your movement observation and assessment skills as a parent. You may know what is best for your child, but only they know what it is like to be in their bodies. So, it is important that we try to empathize, not control or manipulate their body talk. Q: What are some resources for parents and families who appreciate and embrace DMT concepts, principles, and values? A: Parents can always learn more about dance therapy by visiting the American Dance Therapy Association’s website at www.adta.org. If they are in the Chicagoland area, they can also reach out to Chicago Dance Therapy at www.chicagodancetherapy.com or by calling 847.848.0697. Erica Hornthal, MA, LCPC, BC-DMT is a licensed professional clinical counselor and board certified dance/movement therapist. She received her MA in Dance/Movement Therapy and Counseling from Columbia College Chicago and her BS in Psychology from the University of Illinois Champaign-Urbana. Erica is the founder and president of Chicago Dance Therapy. Chicago Dance Therapy is a counseling practice that focuses on the body and mind within the therapeutic relationship. Erica utilizes a somatic approach to engage clients of all ages in talk therapy. Her work has been highlighted in the Chicago Tribune as well as on WCIU and WGN. Feel free to contact her at erica@chicagodancetherapy.com.